FREE?! – It can’t be! This week, our class was discussing what it takes to make a successful website for a company. It’s pretty much a unanimous consensus that if a business plans to be successful in the future, it needs to make sure that its website is mobile ready since the majority of people will be accessing websites via mobile devices by 2015. The use of mobile apps were mentioned in one of our discussion posts. Mobile apps are a great way for businesses to move toward being “mobile ready.” Businesses can even make their own mobile app for FREE! WHAT?!?!?! Nothing is free anymore! But, yep! You can build an app for your company for free. Amazing! This idea could be brilliant for small business owners who may not have the time, large enough staff or budget to do something so helpful to an organization. Granted, building an app is not always going to be beneficial for a company, but there are a lot of small businesses that it could and would be helpful for. 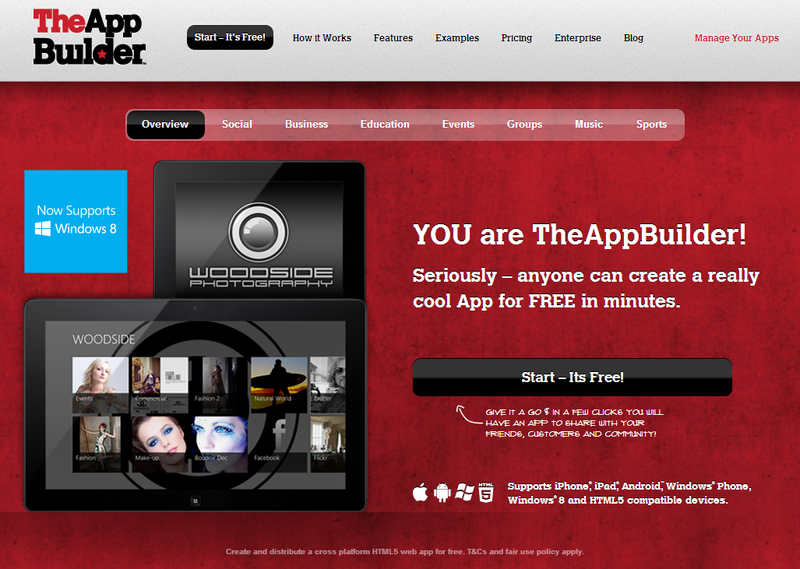 Below is just one example of a free app builder site (theAppBuilder). I am sitting here pondering how I can use this for my photography business, as well as getting my husband’s high-speed internet company to begin using this. He could allow customers to see how much bandwidth they’ve used per month (because there are charges for going over their allotted bandwidth), pay their bill, change their package, receive push notices when there is a network outage and/or scheduled maintenance to be performed, and even provide education on how to troubleshoot when they cannot get their internet at home to work properly, and even have a trouble ticket that they could submit if they are unable to resolve their connection issue to request assistance. What types of small businesses do you think apps would be beneficial for and how? This entry was posted in Emerging Media and tagged business, gadgets, technology by Crystal. Bookmark the permalink. I love how democratizing the app environments have been in letting small developers get great ideas out to the searching masses. I thought I had found the only free app builder (that you have to pay for once you’re ready to publish) but man, I sure was wrong. It’s exciting to be able to now check out theAppBuilder and see how it compares to the CoronaSDK at http://www.coronalabs.com/products/corona-sdk/.